Is it a real Leica? Many FED and Zorki have been transformed by skilled craftsmen in the Ukraine and Russia. Some look ridiculous, some look well-made and can even pass off as real Leica to the less initiated. 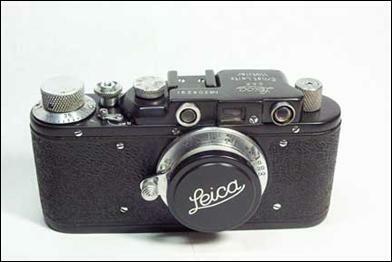 I think that it’s a shame that many good FED and Zorki have to be mutilated to become fake Leicas. These „Leitzified“ cameras sell more. They are curios which should interest collectors more than user-collectors. These modified cameras may look good, but they often function very poorly. So how does one tell a real Leica from a Look-a-Leica? This is supposed to be a Leica II. Its markings say so. Even its serial number (№ 308291) would identify it as a Leica II, according to the Leitz serial number lists. But it’s definitely not a Leica. It had been a chrome-finished Zorki once. Its lens used to be an Industar. Zorki and FED after all were 99% identical to the Leica II. 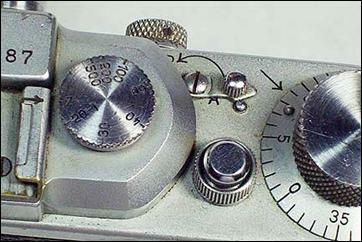 The early shutter button of the Leica was small and elegant-looking. Its collar was removable to accommodate a cup-shaped cable release since the button wasn’t threaded. Models IIIc and later had a slightly larger collar which allowed the cable release to be threaded around the button without removal of the collar. 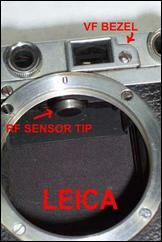 The Leica RF sensor is round and turns. The VF front bezel has a curved shaped around the RF adjustment cover screw. This Leica is really a model III, but its styling is very similar to the Leica II. The model III has strap lugs and an extra slow speed shutter dial on the front panel. Leica had a film loading diagram attached on the base plate (or the shutter crate cover on later models). Soviet Leicas never had this. The tag seen on the Zorki base plate is an identification sticker which I put on all of my cameras. It’s also easy to tell a real Elmar from an Industar made up to look like an Elmar. Click here for details. Side-by-side, the differences between a real Leica and a fake one (or a fake Zorki and a real one?? ?-depending on where one stands) are easy to spot. Details like parts and engraving styles reveal what the cameras really are beneath the rebadging. 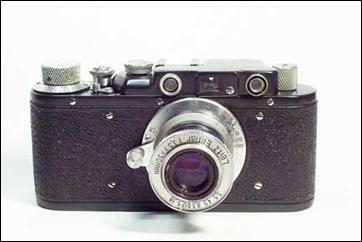 The real Leica is on the left, and on the right is a real Zorki hidden beneath black enamel and Leitz markings. Even FED and Zorki had differences in styling. Both cameras underwent many changes during its production run. Zorki had the most significant changes. Click here to see a comparison between the FED and the Zorki.